This is not the type of girl that you would really want to bring home to meet the parents. Best not to date her at all! Hone-onna (骨女, literally: bone woman) is a being from Japaneselegends. In some versions, it is thought to be a female yōkai who kills men by extracting their lifeforce or by grabbing their hands and holding them until the victim becomes a skeleton himself. In others, the hone onna manifests as a skeletal woman. 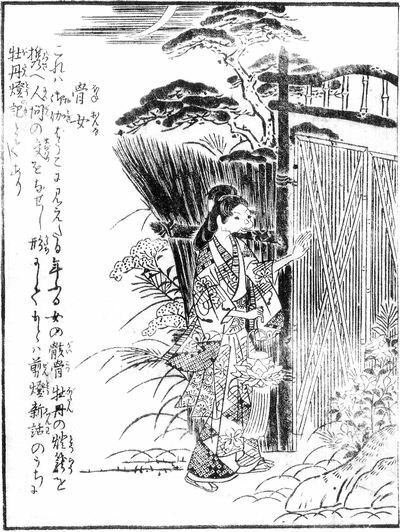 The hone-onna appears first time in a yōkai encyclopedia called Konjaku Gazu Zoku Hyakki, written in 1779 by Toriyama Sekien. The story in which the bone woman is mentioned is named Botan Dōrō (牡丹燈籠; “The Peony Lantern”). It tells about a beautiful, but very skinny lady carrying a red lantern in shape of a peony flower and visiting men in attempt to sleep with them. Botan Dōrō itself is derived from a Buddhist Chinese tale collection named Otogibōko (御伽ばうこ), written by Asai Ryōi in 1666. The collection was composed as some kind of moral-free version of the Chinese work Jiandeng Xinhua written in 1378 by Qu You. More about the dreadful Hone-onna on Wikipedia.